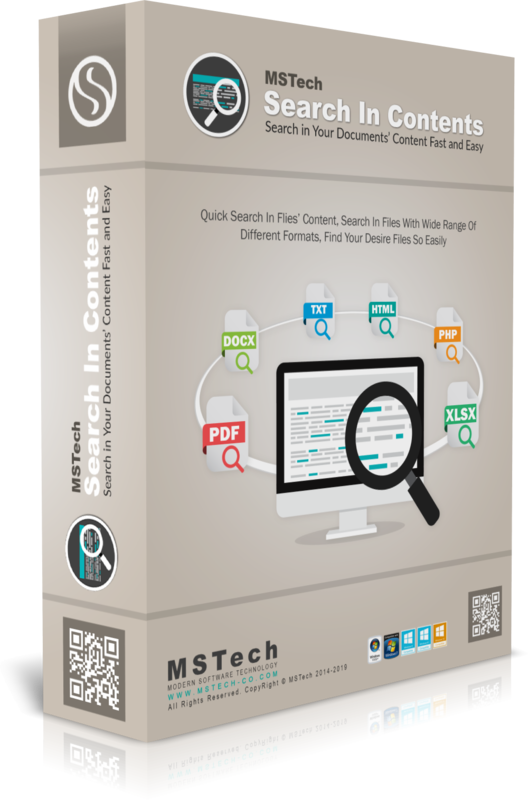 Using MSTech Search in Contents you can easily find what you are looking for, without opening even a single file. Just enter the desired phrase / word, select the path(s) and press search. Software will do the rest. It happens a lot that you are looking for a specific content among thousands of files, while you can’t find it based on the file names. The only way is to go through all documents, one by one and search inside them to find your desired file, which is really a time consuming process. But, by MSTech Search in Contents won’t need to go through all that boring and extremely time consuming process. Using MSTech Search in Contents you can easily find what you are looking for, without opening even a sing file. Just enter the desired phrase / word, select the path(s) and press search. Software will do the rest. Works good. You may need to customize the notification icon so it shows up all the time, since after you close the screen, the only way to reopen the screen for a new search is via that icon. It would be great if it included file name in the search. Right now if I search for the word “test” it will find the files with the word “test” in the contents but not the files names “test”. Please contact our support team to help you with the issue. 1- The software installation is simple and straight forward, and you won’t face any problem. 3- Plus serial number, the only information is required to activate the software is your full name, email address and the country you live in, which we need to serve our customers better. The program froze after a few minutes – an error message came up indicating a memory problem (my memory use was only 43% at the time.) Uninstalled. Why pay for software like this when this do FREE the Notepad++? I’m no expert, but I could not find a search feature in the features list of Notepad++??? The Notepad++ is a editor which first you have to open the files in it (just plain text format*) and then perform a search among the open files. But the Search in Content supports all kind of documents (Rich text, Doc, Docx, Spread Sheets, PDF and etc…). Also This software does not need to open the file and then look inside for your desired phrase.